The Gospel story we have today in a sense marks a nice end-point for my time with you here are at Hamersley. We have been considering events right at the beginning of Jesus’ ministry and I can’t help think that Luke tells us these stories in this sequence to help us get some idea of the things he thinks is important about following the Way of Jesus. Last week we had a story about a most unlikely disciple – the Samaritan – and this week we have an even more extraordinary story of another most unlikely disciple – Mary. A very long time ago when I preached about this I was accused by one person of being a heretic, so I hope I don’t offend any of your sensibilities or sensitivities today, and perhaps the intervening years have given me some capacity to speak a little more wisely about the issues raised by the story. So let’s begin with the story! Mary & Martha were both destined to be significant among the women who surrounded and followed Jesus, but they lived together in a home in a village – a certain village – that Jesus visited. There is no mention here of a brother – Lazarus features in two stories that include Mary & Martha in John’s Gospel. From the various stories we have with both Mary and Martha in them, it seems clear that Martha is the older, and so would be ‘in charge’ of the household. Mary as the younger clearly has a subservient role. Many preachers have tried to characterise Martha as one kind of person and Mary as another – and sometimes they tend to be unkind to Martha in particular. I think Martha is simply doing what she has to do as the hostess, but I feel too far away from the social customs of the day to fully understand the significance of Martha’s question to Jesus asking that he make Mary do some of the work. I also feel that it is too easy for us to insert our modern ideas into the meaning of Jesus reply for us to fully understand it without being what I think is often too harsh on Martha. 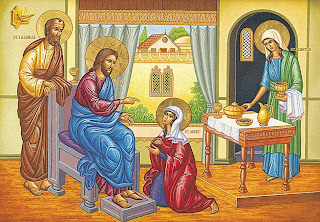 Mary sits at Jesus’ feet, and when Martha seeks to have her removed from that place to undertake domestic duties, Jesus affirms her in that place by saying it will not be taken away from her. These words describe exactly what a disciple would do – St Paul says he “sat at the feet of Gamaliel” (Acts 22:3) and therefore was one of his disciples. Luke knows this and so when he tells us this he is quite unambiguously saying that Mary was a disciple. But what does a disciple do? Last week’s story and this week’s story sit together for a very important reason for Luke. For him “hearing and doing the word” is the ultimate, the most important thing. Someone once observed that this is the decisive activity when building on a solid foundation, in maturing as a grain in good soil, in being a member of Jesus’ family and in being truly blessed – hearing and doing. Mary, in listening to Jesus’ word, has at least begun where faithfulness begins – and it is because of this that she is commended by Jesus. In this she is numbered among Jesus’ disciples – and as we found last week – a very unlikely disciple, because I know enough about social customs to be sure that it was very unusual for a woman to do this, let alone be allowed to do it. In 1983, Barbra Streisand made a movie called “Yentl” in which she was a young girl who wanted to learn about the faith so much that she cross-dressed as a boy so she could go to school – and she got away with it for a long while. But when she was found out it was a huge scandal and was very shameful. So, just as we had an unlikely disciple in a Samaritan in the story that immediately precedes this, here we have an unlikely disciple in Mary. But there is something else about these two – and it is something this differentiates them. These are like two sides of a coin. And the two stories that follow immediately are also like two sides of a coin. Here, in Luke’s understanding of Jesus’ teaching about the Way, we are told about both contemplation and action – listening and doing. The two belong together. The parable of the Good Samaritan highlights the importance of doing – of active service. He is held up to us a model of loving one’s neighbour. Then comes Mary, who is distinguished not for her action, but for her attentive listening to the word of Jesus. Her place alongside the Samaritan affirms that discipleship has to do not only with loving our neighbour, but also with loving God; not only with active service but also with a silent and patient waiting upon Jesus. So the Samaritan and Mary belong together – they are different and they are the same; they tell us about being disciples, and they show us how unlikely they were to be disciples. This is always the hardest part of a sermon. The very least I can say is that we are being called to keep both these things in mind as we try to work out our salvation – ensuring we are spending time listening to God as well as getting involved in caring for our neighbours. The rest I think involves you listening to any little thing that may have come alive for you in the things I have said today. Such promptings are the work of the Holy Spirit, and it is not for me to know what that is for you – but you must pay attention to it – if you are to truly follow Jesus. Loving God, our dearest friend. In Jesus you have shown us how intimate you want to be with us as well as how you want us to live in serving one another, in loving our neighbours. Give to us both the grace and the courage to live for you every day and in every place, and may all we meet know that the Kingdom of God has been near them.